Программатор не блокируется при использовании новых версий ПО 6.82 и выше. Представленная здесь версия оригинального программатора TL866A (в отличие от упрощенной модели TL866CS) поддерживает ISP-режим программирования. Поддерживаемые ОС (32 и 64 bit): Windows 2000 / XP / Vista / Windows 7 / Windows 10. Поддерживается проверка ошибок записи «на лету». Невысокая стоимость, большое количество поддерживаемых микросхем, высокая скорость работы, надежность, простота и мобильность в использовании — все это ставит TL866A в один ряд с профессиональными дорогостоящими программаторами. Список поддерживаемых микросхем - смотреть. 2. The Minimum Volume and the lowest Power Consumption and Do not Feel any Heat in Process. 3. All chips do not need external power supply, the low power consumption of its own to ensure that the USB port can provide enough power. 4. Best internal 40 foot over voltage protection, the strongest VCC/VPP 4-level overcurrent protection. The short-circuit do not reset the PC. 7. Test CMOS4000 74/54 series integrated circuit. Can be located in the gate circuit error. 8. Chip auto serial number is the most complete and practical. 9. Original chip encryptionoperation on AVR microcontroller with internal RC Calibration byte. The Decrypt software can not be directly run on another same type of chip. This programmer has Built-in MCU with high-performance and high-capacity USB interface at the communication speed of 12Mbps being in line with ( For each chip) well-designed programming algorithm and USB high-speed communications. It may be one of the fastest integrated development programmers, the speed has been met the needs of small-quantity efficient production. 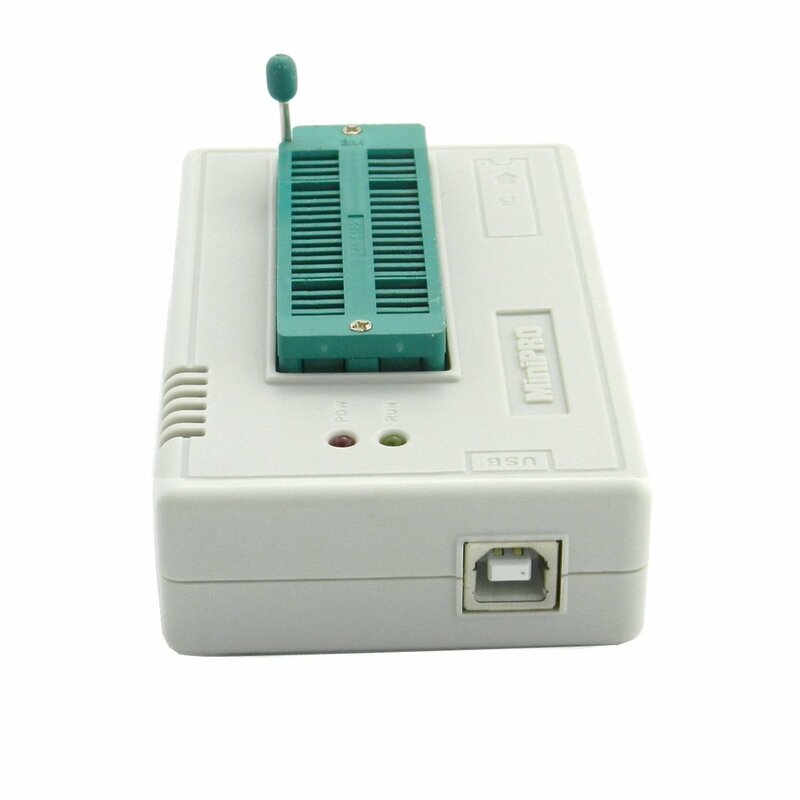 The whole programmer is equipped with the ultra-low power chips and it is furnished with electricity via USB Interface. It is the first comprehensive programmer to program all the chips without an external power supply. Their own power consumption is less than 20mA (it is 7mA when the programmer is not programming, LED power indicator use largest electricity, 5mA each one) and Programming power loss rate is less than 20% so that the programmer can supply the high VCC VPP programming electric current. Programmable chip can be provided with enough programming power (the largest programming power output is 2 watts that is impossible for a chip to use 2 watts of programming power). And you hardly feel the heat of the programmer after such long continuous work. This is one of the smallest products in the world and the dimensions are 10CM*6CM*2.5CM (it is as small as a driving license). In addition, you don't need to carry with an external power supply because of its ultra-low power that makes it more portable. VPP and VCC programming voltages are independently program-controlled: programmable VCC is from 3.3V to 6.5V; VPP is from 3.3V to 21V. The fluctuation of power supply is minor because of the multi-stage LC filter. VCC, VPP power supply of the Programmer is furnished with the independent Grade 3 overcurrent protection and the protection of automatically cutting off power supply. Each pin of 40-pin programming socket has VPP overvoltage protection. It can effectively prevent from putting a chip in the wrong place or short circuit due to other reason. In this programming case, it can also stop VPP high voltage from coming back to the internal of the programmer and damaging the device. Really make sure that the programmer will not be damaged when there is any worst-case short circuit. At the same time, the programmed chip can be efficiently protected. This programmer will cut off the programming power supply VPP and VCC within 100us and send the message to the application program when there is short circuit. The programmer and PC won't be reset when there is short circuit because of the multilevel overcurrent protection. It is the most versatile pin among 40PIN quasi-universal pins. You don't need to move or turn around the chip when programming, just congruously put the chip forward and the handle direction of the programmer is the PIN1 place. Its design accords with the common operating habit of user. This programmer is equipped with upgrading Function of the built-in hardware firmware program that can make sure your programmer's firmware flash and application software can be timely updated. You can complete the upgrade by downloading the upgrading program through the manufacturer's website. This programmer has a variety of automatic numbering functions that are used commonly. You can get any serial number through DLL Dynamic Link Libraries by using the custom algorithm. In mass production, the function enables each chip to produce only one identifying information that can be encrypted by the custom algorithm. So you can effectively protect your rights as a customer. This TL866A programmer can program through the 40-PIN universal socket and is provided with an ICSP serial programming port. For some in-circuit serial programmable chips, you can program MCU by choosing ICSP port. You can get the clear instruction diagram in the programming software for the ICSP port wiring method. That is to say, you can directly program and update the chip soldered on the board. Note: Now ICSP can in-circuit serial program ATMEL89S51, ATMEL89S52, AT45DBxxx, a whole series of AVR ATMEGAxxx, MICROCHIP PIC10Fxxx 12Fxxx 16Fxxx 18Fxxx, as well as a full serial of SYNCMOS SM59Dxx SM59Rxx. The variety of microcontroller that can be supported in-circuit programming will be continually increased in the future. Six ICSP wires of this programmer, except a ground wire, other wires led full functional I2C, SPI and UART serial main wire, be suitable for all kinds of serial communication. In addition, each wire can supply VCC, VPP or GND with high current. This is the first development programmer to test the common logic integrated circuit and this test can be located the errors of logic gate circuit, as well as test any possible input combinations of integrated circuit. This programmer can test itself on each pin of VPP, VCC, GND and I/O information, at the same time it can run an inside short-circuit test on VPP, VCC current. The user interface is well-designed and is in complete accord with the operating habit of the Windows series of software. Built-in binary editer is comparable to pure professional editing software. You can directly read, write and modify the files such as BIN format, HEX format, JED format and so on. In addition, it has the complete and practical project mode that makes the mass production more convenient and safer.